Fish tanks make great additions to your home or office, but it’s harder to make space for a large tank. And, if you’re just starting out, a large tank is a bit intimidating. Instead, choose a 5-gallon tank that you can easily set up and take care of. Some of the best 5-gallon aquarium kits make it really easy to choose a great tank. You don’t have to think about all the individual components and can focus on the fun part: the fish! 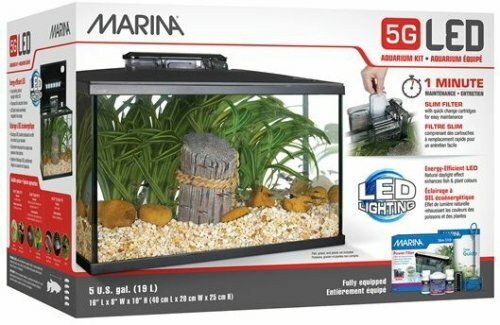 This 5-gallon tank from Marina is made from glass. It’s rectangular in shape with visible black silicone sealing the corner edges. On top is a small black hood with a matching black base underneath. With the tank, you’ll get a Marina Slim S10 filter. It clips onto the side of the tank and filters water using cartridges. Spare filtration cartridges are available to help you keep it maintained at home. In the hood, there’s a built-in LED light setup. This light is made to resemble natural daylight. It’s not made for coral reefs, but it works well for freshwater plants and for viewing your tank. As a bonus, this kit includes other accessories to help you get started immediately. There is a packet of Fluval Max fish food, Fluval Aqua Plus water conditioner, Fluval Cycle biological supplement, and a small mesh net. You’ll get an instruction manual to basic fish care and aquarium maintenance. This is a good starting point for a basic freshwater tank. 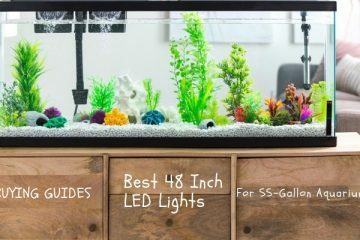 The filter and light included with the kit give you options for what you want to put in the tank, including plants and fish. You’re unlikely to have to add much to this kit to get a good start. 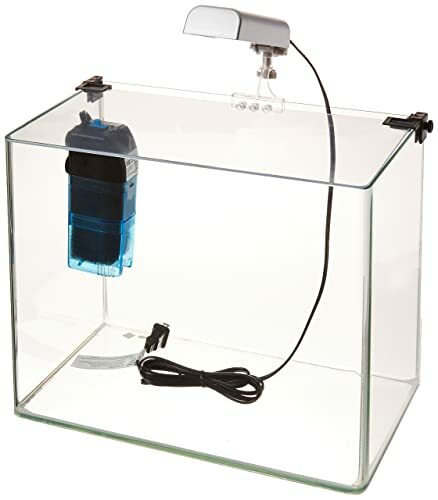 The Fluval Spec V aquarium kit is a small rectangular tank with a built-in sump section on the side. The sump consists of a filter and a small space for a heater or other accessories. The sump side is black or white, along with the base, while the cover and seams are transparent. An LED light rack floats above the tank cover. The system includes 37 LEDs for bright high-output lights at 7000K. Plants and fish thrive under this light, though it’s not meant for coral reefs or live rocks. For filtration, the filter is built into the side sump of the tank. There is a 3-stage filtration system that includes mechanical, biological, and chemical filtration media. Covering the filter, a beautiful honeycomb pattern is etched into the glass so it won’t ruin the aesthetic of the tank overall. This kit comes with the tank, filter components, filtration media, the cover, a low-voltage transformer, the LED lights, and a circulation pump for the filter. For a bit more style in your freshwater tank, this is a good choice. It looks modern and sleek, especially with the filter and other components obscured from sight. Viewable from all sides, the Penn Plax curved corner aquarium has lovely rounded edges on all four sides. It’s rectangular in shape and made from glass. The edges are sealed with transparent silicone for a sleeker look. On top of the tank, the opening is covered by a hinged plastic cover. The cover comes attached to the tank. Through the top, a small LED light shines into the tank. Filtration in this tank comes from the included Cascade internal filtration system. The filter sits just inside the tank and keeps the water clear. It operates using cartridges. In total, this kit includes the rounded glass tank, filter, LED light, a base mat, and the plastic lid. Anyone looking for a more panoramic view of their tank will enjoy this aquarium kit. The view is great from all sides and the tank is well-built for easy viewing. Every story has two sides. What are the good and bad things about this tank kit? As a uniquely shaped option, this MarineLand portrait aquarium is a tall glass tank. It sits on top of a black base with a black built-in filtration area in the back. The front corners of the glass tank are seamless and round. For filtration, the built-in back sump filter provides all 3 stages of filtration. There’s a filter pump as well that keeps up the water circulation and flow within the tank. All of these components neatly hide out of sight. To cover the top, a sliding glass top is included with the tank. Hanging above that from a hinged arm, an LED light sits over top the tank. The light can switch between bright white and soft blue moonlight glow. Another sleek, modern aquarium kit, this is a good choice for anyone with a taller, skinnier place to fill. You can easily keep it in most homes or offices without taking up too much space. If you’re looking to make a more enclosed aquarium environment, this tank from Fluval is a simple choice. It’s a 6-sided enclosed tank with only a small opening at the top. That opening has a cover that connects to the filtration sump area on the back of the tank. This tank is actually 6 gallons, excluding the water taken in by the filter column. All three stages of filtration happen in the back. The lighting also hides inside the decorative column. For lighting, the included fixture is made up of white and blue 7600K LEDs. The light sits overtop the tank and shines through the opening. A small cover sits on top over the light and opening. Unlike most tanks, the top of this tank is also sealed closed with only a small opening in the center back of the tank. It provides a very unique viewing experience from all angles around the tank. If you want your tank to be the centerpiece of a room or to be a statement piece, this is a fantastic choice. 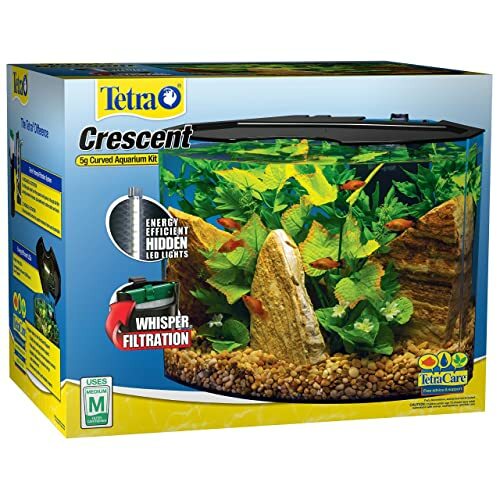 The Tetra Crescent is an acrylic tank shaped close to an oval. Edges are all nearly seamless with only slight distortion. On top, a low-profile plastic lid keeps the tank enclosed. With this kit, you’ll get a filter, filtration media, the tank itself, the cover, and an LED light setup. The light system is made up of 16 LEDs that can be turned on to be bright white or blue. Combined with the shape of the tank, the lighting works to create a great view from all angles. The Whisper internal filtration system works using filter cartridges full of media. You will get all three stages of filtration and can replace the cartridges as needed for easy maintenance. 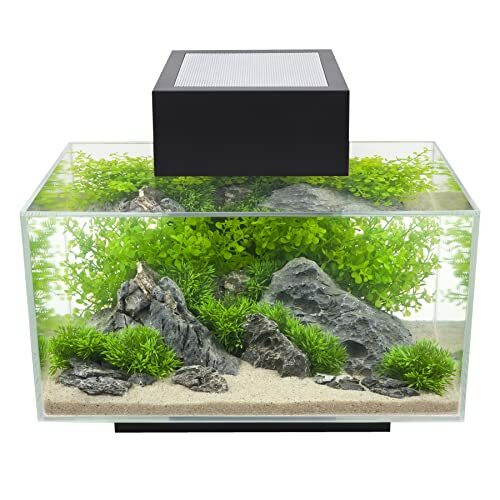 This acrylic tank is a nice option if you want a sturdier material with a rounder shape. Because it’s more transparent around the edges, it makes a great ornament for the living room or your office. Similar to the Tetra Crescent, the GloFish 5 tank is a curved acrylic tank. The edges are virtually seamless, making it easy to see your fish and tank inhabitants from all angles. A black plastic lid covers the top. 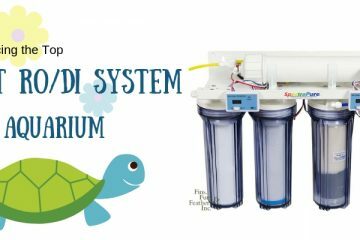 With the aquarium kit, you’ll get an external filter that sits on the back of the tank. It’s a low-flow filter that won’t disturb bettas or other fish that prefer calm waters. The LEDs shining into the tank are a vibrant blue. 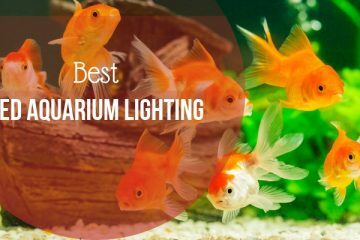 This gives your fish, plants, and decorations a fun glow while the light is on. You can turn it on and off with a switch. This is a fun tank for kids. They’ll enjoy the blue light, glowing neon rocks, and the smaller size. It’s a good beginner fish tank for freshwater fish. Both are possible, but freshwater is a better option. 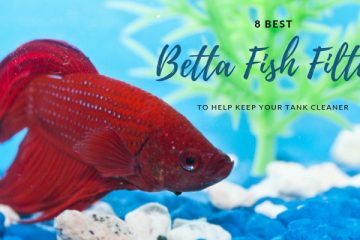 Freshwater tanks give you more options at 5 gallons, including in fish choice. Maintaining tiny freshwater tanks is also easier because the water quality parameters are not as sensitive as those in a saltwater tank. Saltwater tanks get more complex the smaller they are. If you want to try a 5-gallon saltwater tank, reef tanks and invertebrate tanks are easier than stocking fish. However, you can also set up a fish tank if you get the right type of fish that will thrive in a small space. No matter which type of tank you’re going for, selecting your inhabitants is a big part of choosing the right tank. If you want a vibrant, fully stocked tank, you’ll get a fuller load with a freshwater tank than a saltwater tank. 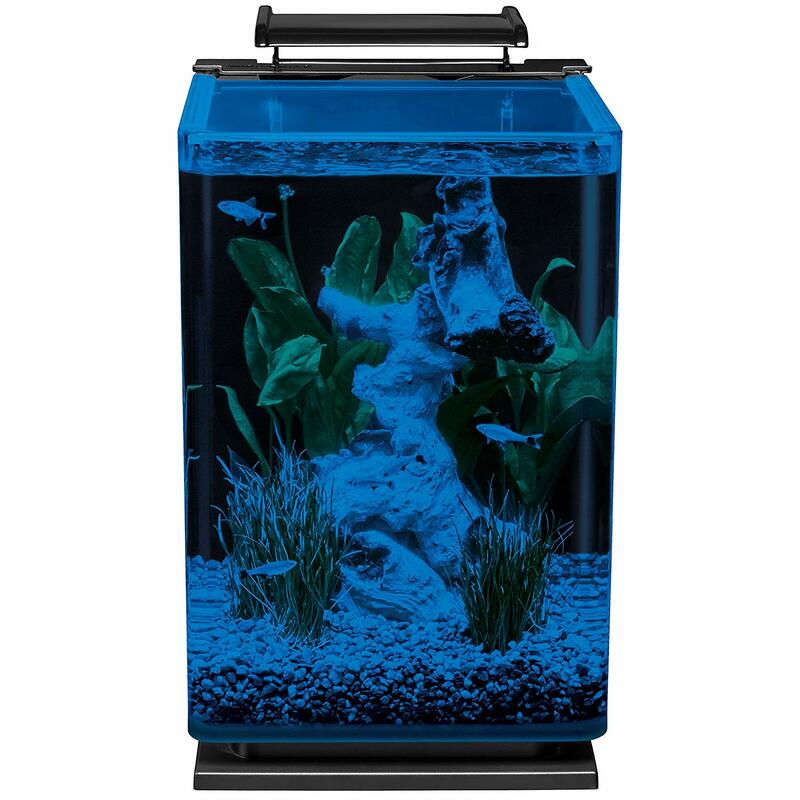 Five-gallon tanks are available as both acrylic and glass in different shapes and designs. 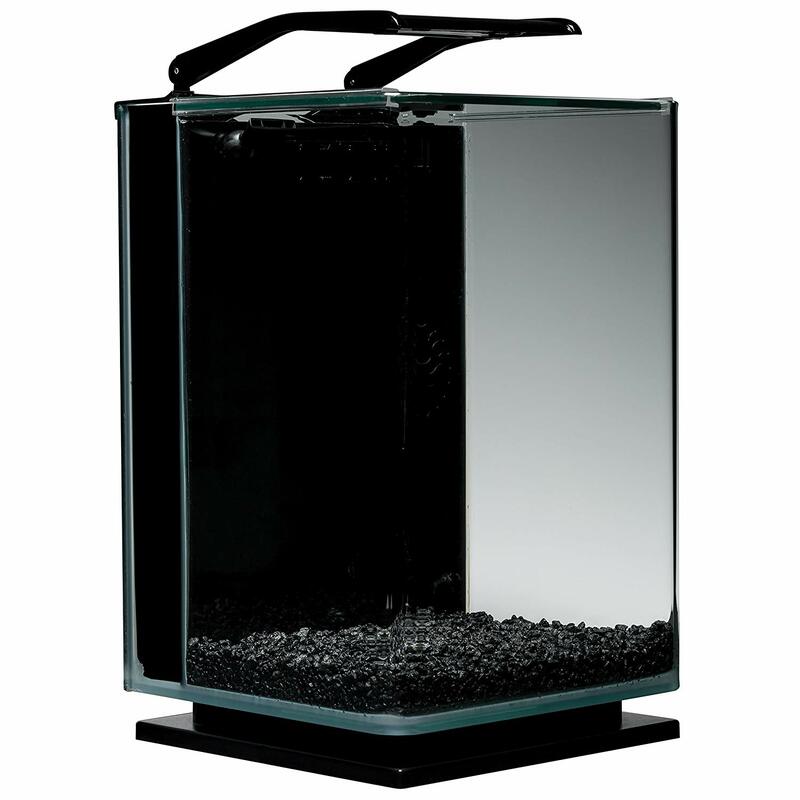 Each type of tank is clear and will hold its shape in a 5-gallon size. However, there are still some distinct differences between each. Acrylic tanks tend to scratch easily. You have to be careful when you’re cleaning the tank, and you may have to select your substrate and decorations carefully. 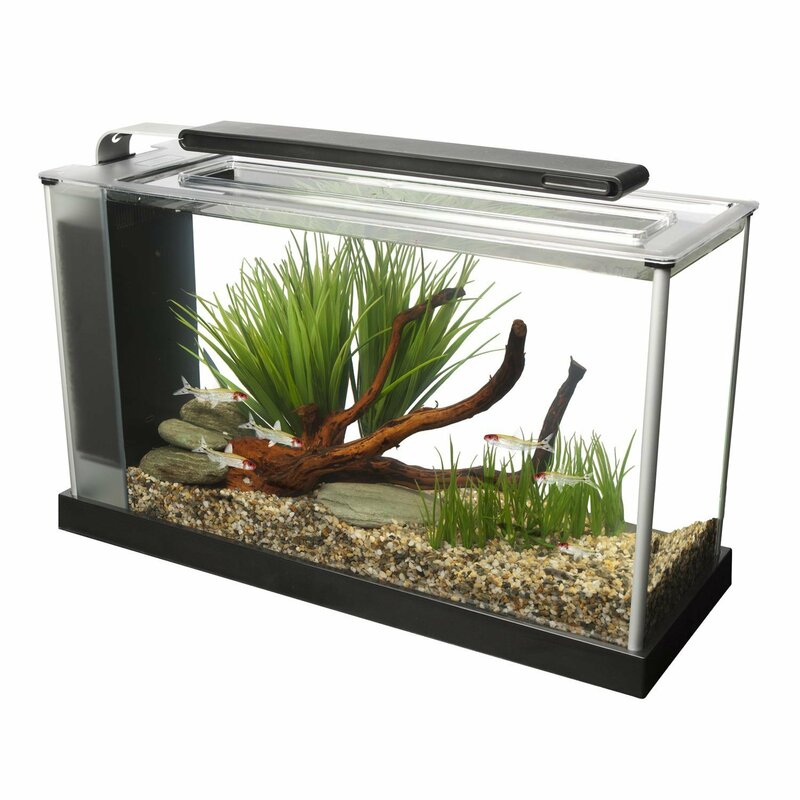 But, acrylic tanks are very durable and won’t chip or crack under normal circumstances. Glass tanks are cheaper than acrylic nine times out of ten. They’re also more likely to remain clear over time instead of clouding up or getting scratched. The downside to glass is it’s not as durable as acrylic and is more likely to chip or crack over long periods of time. Not all 5-gallon tank kits come with filters, but they all should. Even if you’re housing only one fish in your tank, a filter will improve water quality. Better water qualityimproves the health and lifespan of whatever’s in your tank. 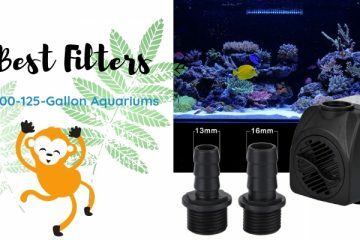 Filters for nano tanks need to have the right balance of power. If they’re too strong, they’ll overpower the tank and create too much disturbance. If they’re too weak, they won’t do anything and you’ll still have to do a lot of water changes. Get a filter that matches your tank size. There’s little consistency when it comes to aquarium kits for smaller tanks. With 5 gallons, you’re likely to get the tank, hood, and maybe a filter. You may need more than this. 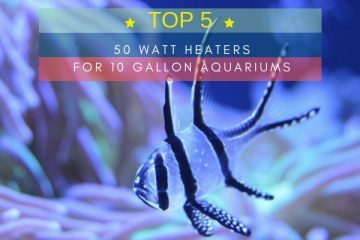 If you plan to keep tropical fish and you don’t live in the warmer area, you may need a heater. You may also need an LED light, especially for a 5-gallon nano reef tank. Other kit pieces are nice extras but are not a requirement. You have a lot of choices when it comes to the shape you want for a 5-gallon tank. This is almost entirely an aesthetic choice for you because it won’t make a difference for the fish. In a 5-gallon tank, there is a lot of evaporation and a limited area to swim no matter what. For a good, simple kit, go for the Marina LED Aquarium Kit. 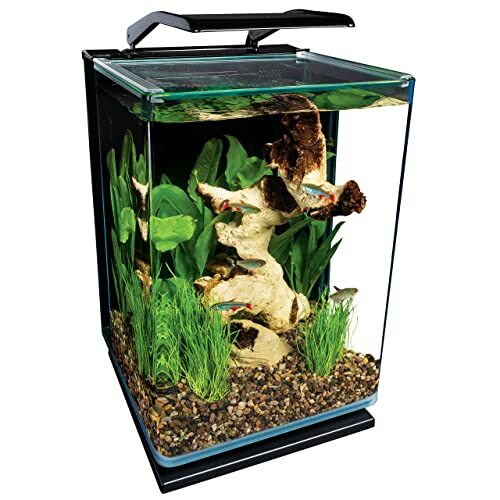 It’s a solid aquarium kit that just needs the addition of a heater to work well for most tropical freshwater fish. 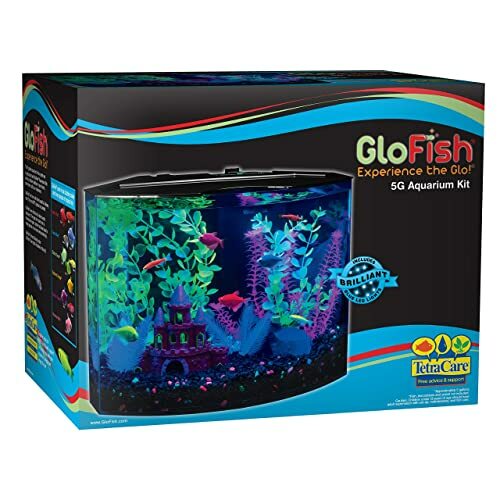 If you’re in the market for a small tank that’s a bit better for beginners, the GloFish 5 Gallon Crescent Aquarium Kit is a fun choice for kids and families. Whatever you choose, make sure you base it off the facts. 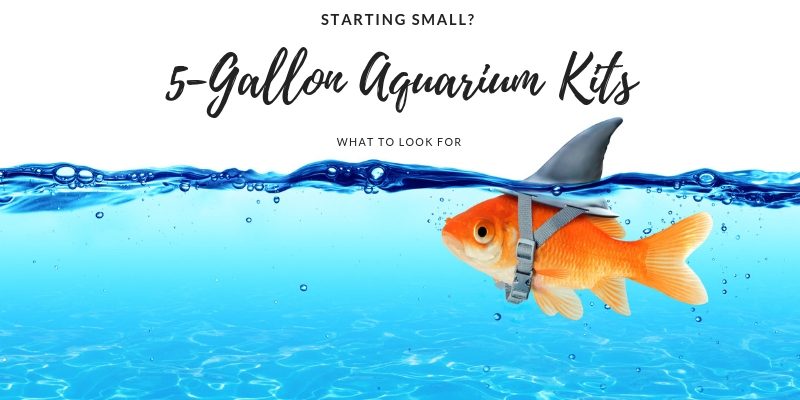 Learn about what makes the best 5-gallon fish tank kit different from the rest and pick what suits your needs the most.